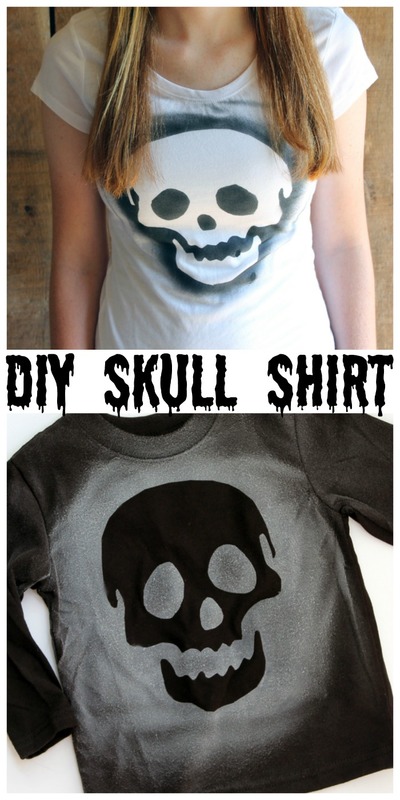 I am going to show you how to make this easy skull shirt for Halloween or anytime of the year really. This project is made simple with a few tricks and a great airbrush that is easy enough for kids to use. I was asked to do a sponsored post for Testors with their Airbrainz Airbrush and immediately thought of something Halloween. The product is perfect for quick and easy shirts and costumes for the holiday. 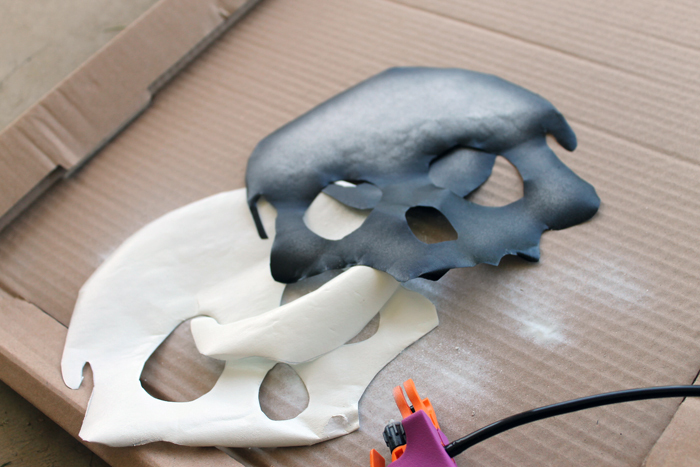 You can read a bit more about the Airbrainz Airbrush from Testors by clicking here. This is my second project with it and I must say it gets easier every time (if that is even possible). This time I am doing the masking a little differently. I am using freezer paper. Yes that stuff in your kitchen drawer. It works great as a masking. 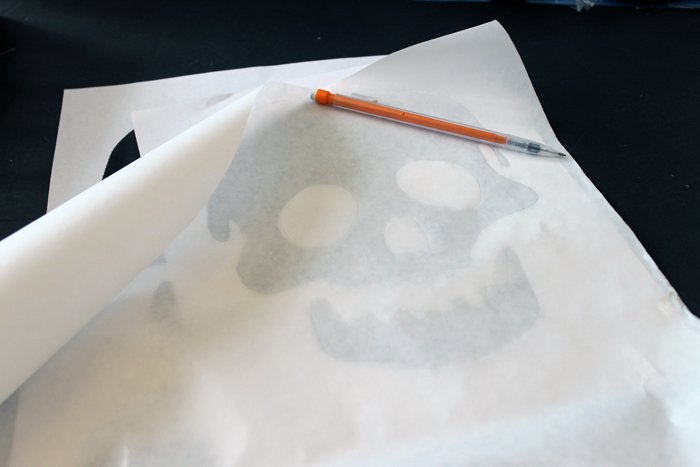 Just put your image under a piece of freezer paper and trace around with a pencil. 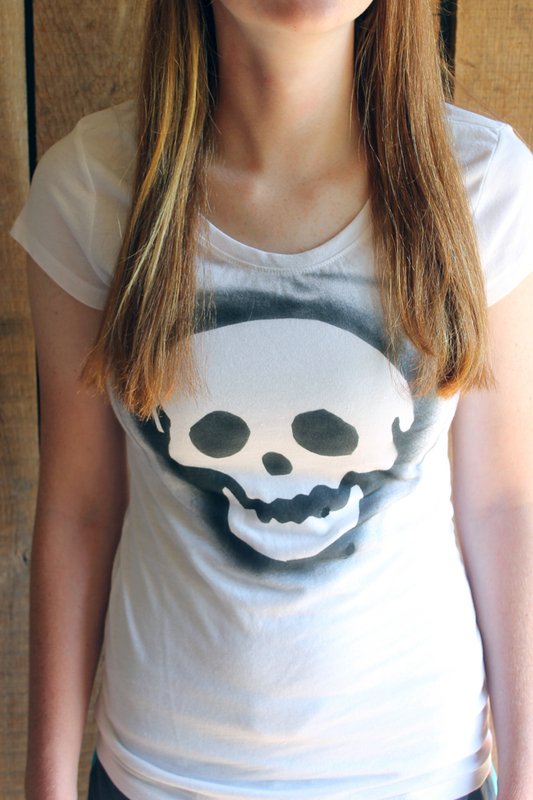 Use scissors to cut around those pencil lines until you are left with just the image that you want to mask on the shirt. Place the image onto the shirt shiny side down and go over the entire thing with a hot iron. Your masking will be adhered to your shirt and you are ready to airbrush. Use the Airbrainz Airbrush from Testors to go over your project. 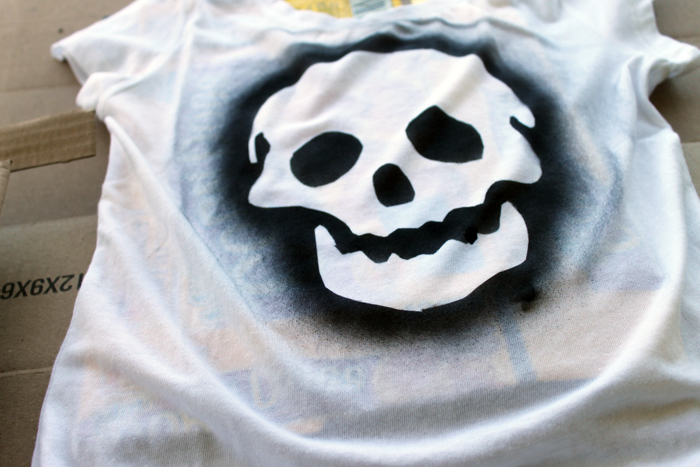 I did both black paint on a white shirt and white paint on a black shirt. You can actually watch the entire process in the quick video below. This proves just how easy this is! You will peel your masking off of your shirt after airbrushing. The freezer paper lifts right off of the shirt with just your fingers. And you are left with a nice clean line on your airbrush design. Great right? 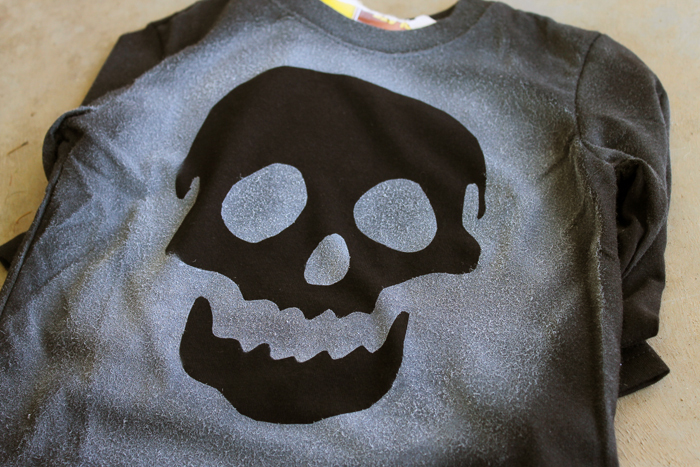 Make either version of this easy skull shirt for Halloween with your kids. Let your imagination run wild and come up with other shapes for this technique as well. Have an idea for a costume and not quite sure how to pull it off? Let the Airbrainz Airbrush from Testors help! 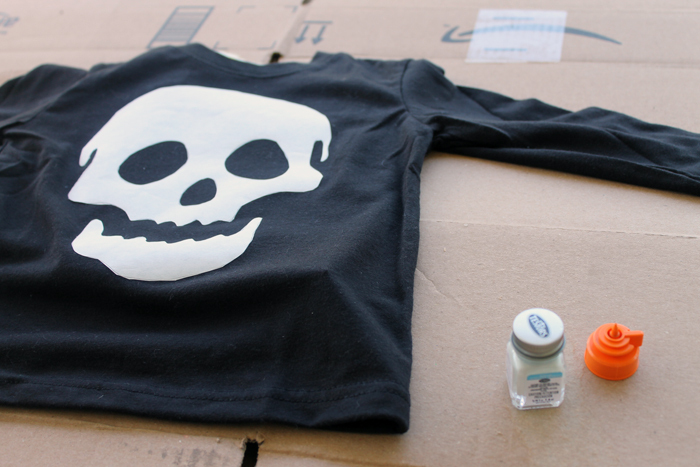 Add any shape to a shirt using the same method as our easy skull shirt for Halloween. You will love the quick and easy results! 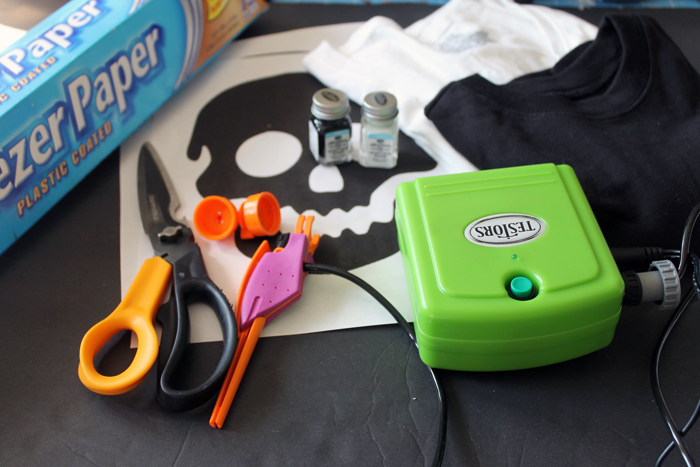 Want more projects with your kids this Halloween? Try this idea for custom pumpkin carving! previous post: Unique Clocks – The Perfect Holiday Gift! 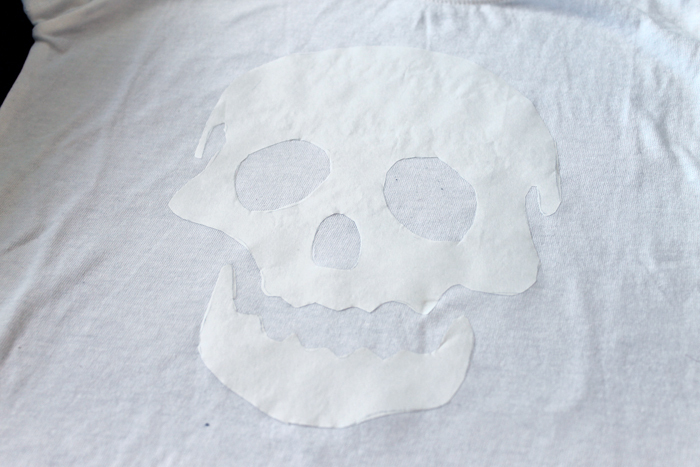 I love freezer paper stencils. Nice work. 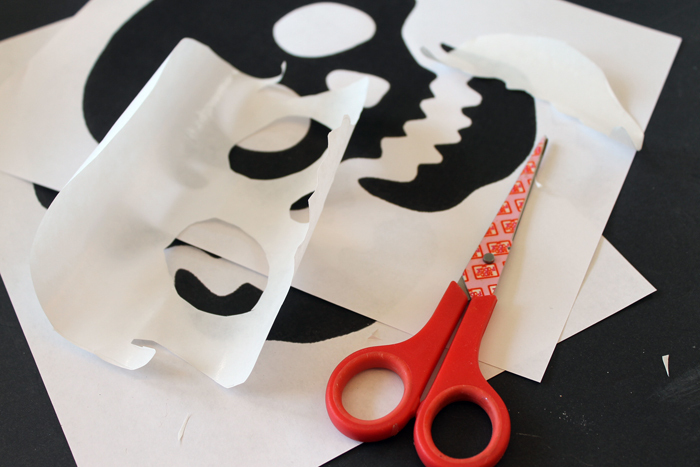 Have you tried your hand with an exacto knife to cut the stencil out? I can place the my stencil image on top of 2 pieces of freezer paper to get 4 stencils 2 positive stencils and 2 negative stencils. I am not the best with a craft knife but yes that would definitely work! Super adorable and so easy! I think everyone should make one! This turned out really neat! What a neat idea! These are so cool to wear and I love how easy it is to make. Thank you for sharing at Dishing it and Digging it link party Angie. We love having you and hope you come share again this coming Sunday. Have a great weekend.